Join Les and experience a 2 ½ hour tour exploring the coastline between Whitianga and Hot Water Beach like no other. 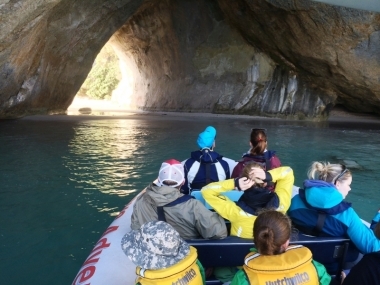 Embarking at Whitianga Wharf, cruise along the coastline, visit the world renown Cathedral Cove, enjoy the views of golden beaches, magnificent scenery, offshore islands, spectacular blowholes and towering rock faces. Slowly cruise inside the incredible sea caves, admiring the natural beauty all from the comfort of our purpose built boat. Get close and snorkel with the abundent marine life in Gemstone bay or swim the amazing waters of Orua Cave – the second biggest sea cave in New Zealand. All seats face forward giving you perfect photographing opportunities.